Inspired by the light and colors of both her native Mexico and her adopted hometown of Los Angeles, stylist, artist and designer Beatrice Valenzuela creates work that exudes a vibrant, dynamic warmth. Forms are organic, flowing, feminine; shades are vivid and deep and drawn from the natural world. Encompassing clothing, shoes, jewelry and accessories, Beatrice Valenzuela’s work is a distinctive reflection of her background, her surroundings, and her family. 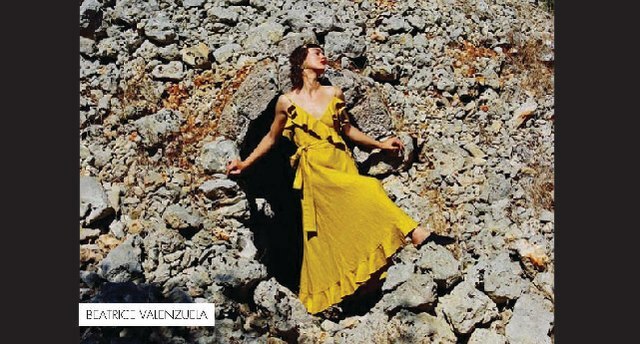 In 2009, Valenzuela debuted her now iconic shoe line. Handmade and elegantly simple, Valenzuela’s footwear quickly developed a cult following and her unique aesthetic began to extend to not only to accessories and clothing, but to interiors and immersive environments – an Airbnb interior she designed with her partner, the designer Ramsey Conder, as well as the opening of a local boutique and the founding of Valenzuela’s hugely popular bi-annual arts market, The Echo Park Craft Fair. Throughout, she has been creating, dreaming up everything from candles to wall hangings and producing a vast range of creations – beautiful bags, intricate jewelry in silver, brass and wood. The designer just launched her new clothing line, an assortment of thrillingly feminine skirts, dresses and tops – each piece imbued with the artist’s playful but discerning eye.